Cotton Mop Hanks Blue 1.5 lb. Blue denim yarn. Economical and inexpensive. Blue denim yarn. Economical and inexpensive, 100% cotton with good pick up. Packed in 60 lb. cartons. Uses 6',7' or 8' mop handles with mop adapter - staple type. 40/ctn. Cotton Mop Hanks Blue 2 lb. Blue denim yarn. Economical and inexpensive, 100% cotton with good pick up. Packed in 60 lb. cartons. Uses 6',7' or 8' mop handles with mop adapter - staple type. 30/ctn. Cotton Mop Hanks Blue 2.5 lb. Blue denim yarn. Economical and inexpensive, 100% cotton with good pick up. Packed in 60 lb. cartons. Uses 6',7' or 8' mop handles with mop adapter - staple type. 24/ctn. 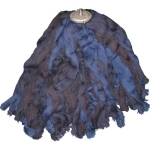 Cotton Mop Hanks Blue 3 lb. Blue denim yarn. Economical and inexpensive, 100% cotton with good pick up. Packed in 60 lb. cartons. Uses 6',7' or 8' mop handles with mop adapter - staple type. 20/ctn. Cotton Mop Hanks White 2 lb. Mixed plied yarns, does a heavy duty job. 100% cotton. Packed in 60 lb. cartons. Uses 6', 7' or 8' mop handles with with mop adapter - staple type. 30/ctn. Cotton Mop Hanks White 2.5 lb. Mixed plied yarns, does a heavy duty job. 100% cotton. Packed in 60 lb. cartons. Uses 6', 7' or 8' mop handles with with mop adapter - staple type. 24/ctn. Cotton Mop Hanks White 3 lb. Mixed plied yarns, does a heavy duty job. 100% cotton. Packed in 60 lb. cartons. Uses 6', 7' or 8' mop handles with with mop adapter - staple type. 20/ctn. Cotton Mop Screwhead Blue 1.5 lb. Blue denim yarn. 100% cotton. Economical and inexpensive, with good pick up. Uses 6', 7' or 8' mop handles with mop adapter - screw type. Screw type fitting holds mop securely to handle. Easy to attach or remove. Packed in 60 lb. cartons. 40/ctn. Cotton Mop Screwhead Blue 2 lb. Blue denim yarn. 100% cotton. Economical and inexpensive, with good pick up. 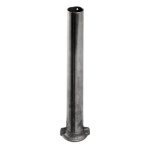 Uses 6', 7' or 8' mop handles with mop adapter - screw type. Screw type fitting holds mop securely to handle. Easy to attach or remove. Packed in 60 lb. cartons. 30/ctn. Cotton Mop Screwhead Blue 2.5 lb. Blue denim yarn. 100% cotton. Economical and inexpensive, with good pick up. Uses 6', 7' or 8' mop handles with mop adapter - screw type. Screw type fitting holds mop securely to handle. Easy to attach or remove. Packed in 60 lb. cartons. 24/ctn. Cotton Mop Screwhead Blue 3 lb. Blue denim yarn. 100% cotton. Economical and inexpensive, with good pick up. Uses 6', 7' or 8' mop handles with mop adapter - screw type. Screw type fitting holds mop securely to handle. Easy to attach or remove. Packed in 60 lb. cartons. 20/ctn. Cotton Mop Screwhead White 1.5 lb. Mixed plied yarns, does a heavy duty job. 100% cotton. Uses 6', 7' or 8' mop handles with mop adapter - screw type. Screw Type fitting holds mop securely to handle. Easy to attach or remove. Packed in 60 lb. cartons. 40/ctn. Cotton Mop Screwhead White 2 lb. Cotton Mop Screwhead White 2.5 lb. Cotton Mop Screwhead White 3 lb. Kirby Fiberglass Applicator Big Man 11.5 lb. The "Top of the Line" glass fiber mop. Built with unplied glass fiber in the center core for maximum pick-up and a blend of unplied Glasphalt and standard twist & plied Glasphalt yarn on the outside for good wear. The K.F. Applicator has built-in voids in the head for added pick-up - in fact, it's guaranteed to pick up more than any other glass fiber mop. The unique design creates a wider spread and a more uniform delivery, no holidays. Kirby Fiberglass Applicator Champion 4 lb. Kirby Fiberglass Applicator Hercules 10 lb. Kirby Fiberglass Applicator Monster 8.5 lb. Kirby Fiberglass Circle Mop 1 lb. 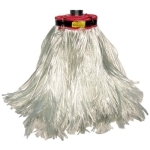 The Fiberglass Circle Mop is for the roofer who wants to make his own mop. A blend of unplied and standard twist and plied Glasphalt yarn, is pressed into a 1-3/8” grommet for easy assembly. Requires Circle Mop Adapter (not included). 50 mops per case. Kirby Fiberglass Circle Mop 2 lb. The Fiberglass Circle Mop is for the roofer who wants to make his own mop. A blend of unplied and standard twist and plied Glasphalt yarn, is pressed into a 1-3/8” grommet for easy assembly. Requires Circle Mop Adapter (not included). Kirby Fiberglass Circle Mop Phoenix 1 lb. Kirby Fiberglass Phoenix Pinhead 12 lb. Kirby Fiberglass Phoenix Pinhead 15 lb. Kirby Fiberglass Phoenix Pinhead 4 lb. Kirby Fiberglass Phoenix Pinhead 6 lb. Kirby Fiberglass Phoenix Pinhead 8 lb. Kirby Fiberglass Screwhead Mop 4 lb. This is the traditional style screwhead mop, made with a blend of unplied and standard twist & plied Glasphalt yarn. *Requires Adapter-Screw Type. Kirby Fiberglass Screwhead Mop 5 lb. Kirby Fiberglass Screwhead Mop 6 lb. Staple through mop bell holds yarn securely. Used with mop hanks, Staple holds yarn securely through staple type mop adapter. 5" staples, 100/pack. Roller Mop Frame 12 in. Roller Mop Frame 18 in. 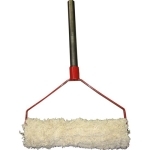 Roller Mop Roller 12 in. Roller Mop Roller 18 in. Kirby Fiberglass Applicator Midget 2.1 lb.